If you are in Nigeria, it will be much easier for you to walk or drive to your favorite Suya Mallam popularly known as Mai Suya and buy the Nigerian Suya made from his own trademark blend of Suya spices. We also have Chicken Suya and Ram Suya. 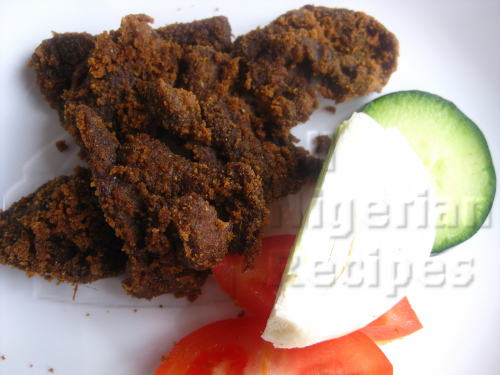 Feel free to prepare suya with your favourite meats: lamb, pork etc. Once you dab any meat in the Suya Pepper seasoning and grill, it is SUYA! Every Mai Suya and his team have their own unique blend of kuli kuli (groundnut/peanut butter deepfried till crunchy), ground ginger, pepper flakes, stock cubes and salt to come up with the Suya spice that draws people out of their homes at dusk to have some tasty Suya. The love for Nigerian Suya is not limited to young girls on a first date. Everybody, young and old, loves Suya which is made by roasting fillets of the best parts of beef, dabbed in the perfect Suya spice, at the right temperatures. Yummmm! If you are a Nigerian living in diaspora, you can't remember the last time you had this snack and you just want to make it in your home and savor the taste of homeland, keep reading. If you live in Nigeria, please stop reading right now, go to your nearest Mai Suya and order as much Suya as you can eat pleaaaaaase. lol! Beef: The best cut with as little fat as possible. 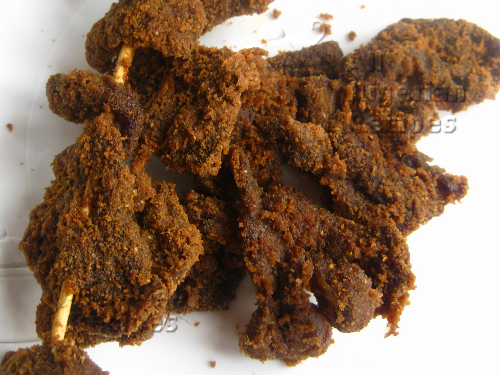 You can buy the suya spice (suya pepper) in African food stores, you can also make yours. 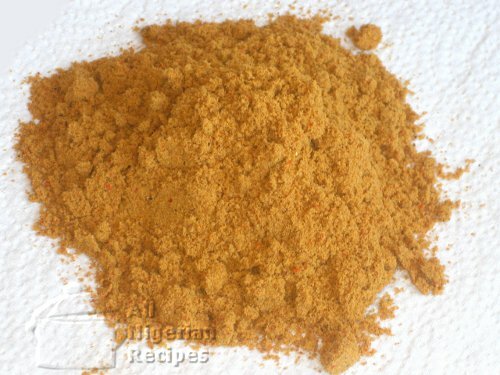 Visit How to make Nigerian Suya Spice for details. If you do not have groundnut oil (peanut oil), use any tasteless and odourless vegetable oil eg sunflower oil. I usually soak the Suya sticks in cold water for at least 5 hours. This ensures that the sticks do not burn during the roasting of the Suya. Cut the beef into very thin fillets. Where I live, the butchers have the perfect appliance for this. All I have to do is tell them how thin I want the fillets and it is done for me in no time. If you don't have butchers that will do this for you, just do your best, ok? 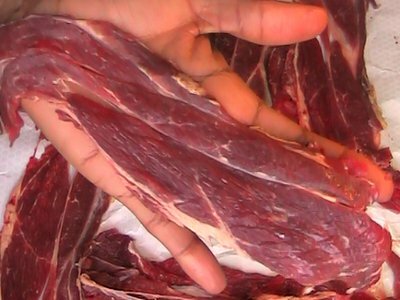 Usually, if you freeze the beef a little bit, it makes the cutting easier but Suya Mallams say that if you want to make the best Suya, do not refrigerate or freeze the beef. Click on the small images to enlarge. If the fillets are long and large, cut them into small pieces such that when you thread them on the sticks, they will not flap too much. 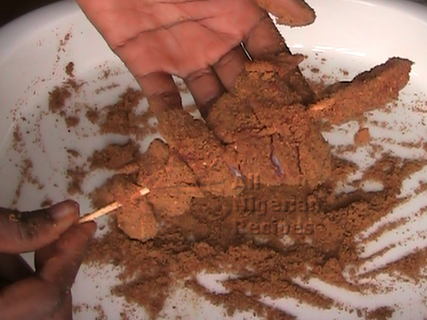 Now thread the fillets of beef on the Suya sticks as shown in the video below. Putting the beef on sticks is optional but it's not Nigerian Suya dear if it's not on a stick. lol! Put some groundnut (peanut) oil in a bowl, add a small quantity of salt and stir. Using a cooking brush, rub the groundnut (peanut) oil on the threaded fillets of beef. This is what helps the Suya spice stick to the meat so make sure you do not leave out any part of the meat. In a wide dish, spread the Suya spice and dab the threaded fillets of beef in the spice so that the beef takes up as much of the spice as possible. All the beef will be covered with the Suya spice when you are done. Place the beef flat on the oven rack and put in the oven to roast. After 15 – 20 minutes, flip the beef to roast the underside as well. The length of time you’ll roast each side depends on how thick the fillets are. So total roasting time for both sides of the beef is 30 – 40 minutes. Rub some of the remaining groundnut oil on both sides of the beef. Increase the oven temperature a bit and roast either side of the beef for 5 minutes each. Serve with chunks of onions, tomatoes cabbage and cucumber. Then a chilled drink. Yummy!